The passionate Chef Tan-San started Hajime in 2016. 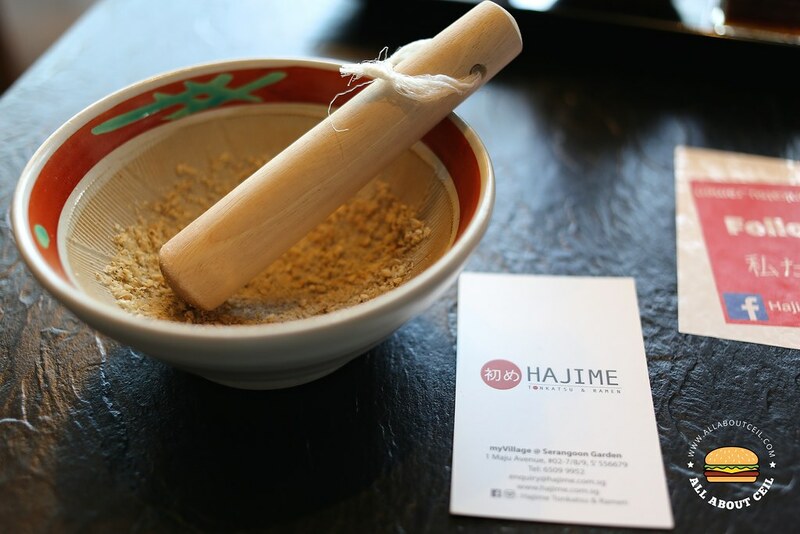 'Hajime' is the Japanese word for 'beginning' and the short form for 'Hajimemashite', which means 'Nice to meet you'. He has about 25 years of experience in Japanese cuisine and it began after a stint in Japan, where he mastered the art of Tonkatsu and returned in 1993 to helm the kitchen of Tonkichi, the first Tonkatsu speciality restaurant chain and that making him the first Tonkatsu chef in Singapore. 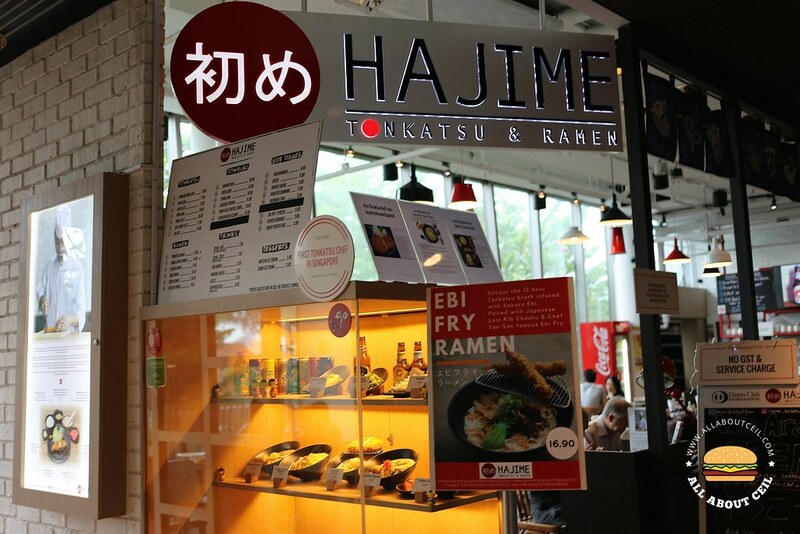 In 2004, he took on the challenge of starting up Tampopo, a new Japanese concept restaurant which has since become a household name for authentic Japanese cuisine in Singapore. 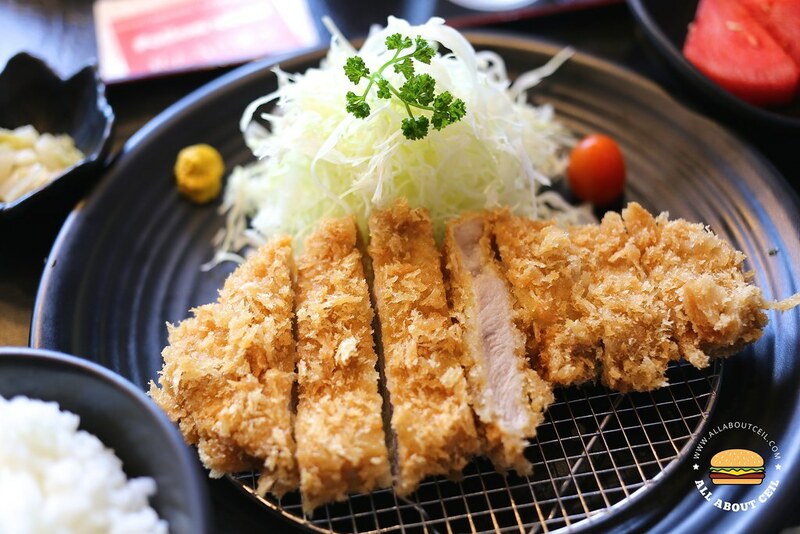 Chef Tan-San is known for various creations such as Kurobuta Pork Tonkatsu and Tonkatsu Ramen. I was led to a table for 2 at the corner and is right in front of the corner, near to the other exist. The menu was presented right after. I was asked, "Are you here for the first time?" I nodded. I was then told to mark the order on the order chit and presented it at the counter together with payment. It will be served to the table, though. I decided to go with their Premium Pork Loin ($19.90) since it is listed as a must-try. It consists of a premium cut of air-flown pork from Japan that is specially chosen for its tenderness and juiciness. I also ordered a canned drink to go along. I brought the order chit to the counter and made the payment. I was given a glass with ice cubes in it which I brought it back to the table. The lady at the counter came over with the canned drink. Then, I took notice that there is a fridge right beside the counter where they stored all the canned drinks. I guess I might be expected to pick it up right there after paying but I was not informed to do so. I was presented with a bowl of sesame seeds and a grinder. I was then asked, "Do you know what to do with this?" I nodded. I waited for about 5 minutes before my food came. I was also told that the rice and shredded cabbage are free-flow and I just need to make the request over the counter. To start, I have to add the Tonkatsu sauce to the finely ground roasted sesame seeds for extra flavour and then drizzled the cabbage dressing over the shredded cabbage. The cabbage was crunchy and added a refreshing twist when eating it together. The pork Loin was coated with a layer of breadcrumb before deep-frying, for the desired crispiness. It was perfectly done and not greasy at all. The rice is sourced from Niigata and is grown in pristine waters from melting snow then milled locally to lock in its freshness. It is also served along with Tonjiru Soup that is made from Tonkotsu broth simmered with Japanese pork and a hint of yuzu for over 12 hours. My first mouthful of that perfectly fried Tonkotsu was a pleasant surprise. It tasted as good as what I had eaten in Japan. 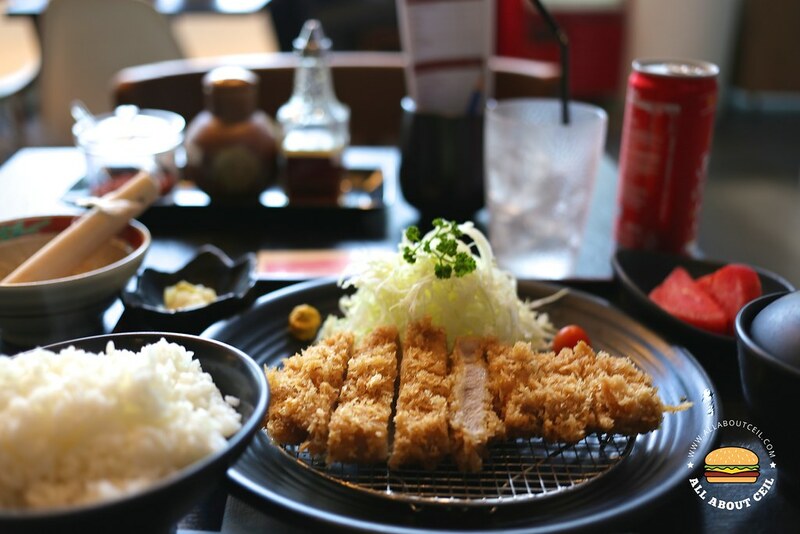 It was much better that I expected it to be and is probably one of the best, if not the, best Tonkatsu in Singapore. 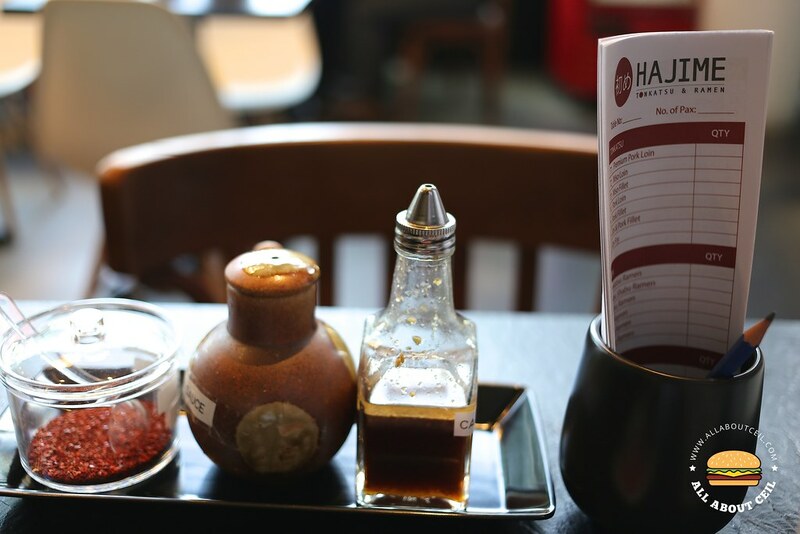 Their signature dishes include Miso Fillet ($17.90), Tonkatsu Ramen ($14.90) and Shabu Shabu Ramen ($14.90). There are also Donburi options like Salmon Don ($16.90), Chicken Teriyaki Don ($15.90) and Pork Fillet Katsu Curry ($15.90) with side dishes like Gyoza ($6.90), Agedashi Tofu ($3.90), Pork Korokke ($3.90) and Tori Karaage ($4.90) available. They do not charge GST nor service charge here, which is a good thing, this means having Tonkatsu can be quite affordable.